If anyone knows how the science of modern marketing works, it’s Andy Crestodina, co-founder of Orbit Media Studios. So why is this website-development-content-marketing-SEO-and-analytics “scientist’ investing in the art of conversation? 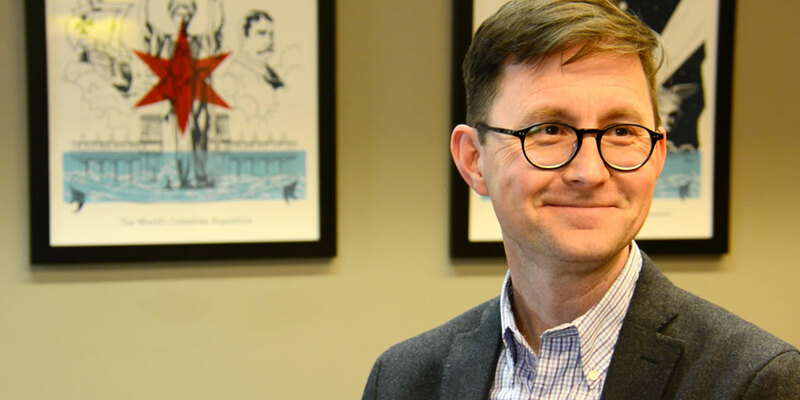 I had the chance to sit down and discuss all of that with Andy, starting with one of my favorite examples of conversation leadership: Wine & Web, the monthly drink-meet-learn event hosted at the Orbit Media office in Chicago. Chuck Kent: What was the genesis of Wine & Web? Andy Crestodina: We had this idea six or seven years ago to take our space, along with the networks we have here in Chicago, and combine those ingredients into a little event where we have a chance to teach. We made it an open house format, so when people come in there’s a slight marketing benefit, because they get to see we’re a legit company, we’re not virtual, we don’t outsource things. And it’s a networking benefit to us, because we get to meet new people. We host it in a large conference room right next to the kitchen, where we serve pizza and wine. So it’s really just a format for content, but one that’s high-touch, interpersonal and face-to-face. And once we tried it, it worked well, so we kept doing it — and have done it every month ever since. Chuck: To me it’s an excellent, and particularly creative, example of what I and others like to call “conversation leadership,” because you’re not just pushing out your own thoughts but you’re inviting people in to share theirs. So why do you see that as an essential part of your content mix? Andy: Well, it’s a foolish marketer that tries to go it alone. It’s a lonely blogger or a failed leader who tries to be the only person in the conversation. That’s not a conversation. That’s monologue. It’s a foolish marketer that tries to go it alone. You and I both appreciate dialogue and listening and getting feedback, collaborating and including others in our formats. So for us this is fantastic, because we have guest speakers, not always just me. We do interviews occasionally, so it’s definitely that collaborative philosophy, an approach to content marketing that choses to include many voices, just as a journalist would include many sources. Chuck: The speakers at Wine & Web cover much broader turf than, say, your very focused blog. What’s the benefit to you in that? Andy: Well, it’s part of a mix. The idea isn’t to just be active in one format or one channel. It’s smart to experiment a little bit a — and Wine & Web was an experiment from the beginning. As a format it worked well in our mix, partly because we have a local relevance and a physical location. We speak at other conferences and events, so this a chance to try out different formats and topics in a smaller group before we do it something on a big stage. And we also have an annual conference of our own called Content Jam, and this is a chance to try speakers here, to see if they might work at the conference, which is a much, much bigger group. It’s smart to experiment a little. All in all, it becomes a virtuous cycle of, “Okay, that worked at Wine and Web… let’s make a video for it…and that video will be part of a blog post…and so on.” It’s good because you need to create interconnected hubs of content, interrelated topics, complimentary formats. You need to have co-contributors and co-create with influencers. And doing things offline, bringing people in for face-to-face experiences — it helps you hit every note. Chuck: So, to jump on your musical metaphor, do marketers have to have all the notes? Do you have to have the entire song or can you get by emphasizing just one? Chuck: I think I first got to know you because I sang about you, in my “Social Song Saturday” period. Andy: So great. I loved it. That was brilliant. Chuck: Did you notice how I worked in my own compliment there? Andy: I’ll never forget it. and I’ve talked about it many times since. But back to your question. Do we have to hit all the notes? No, we don’t — but we do have to keep trying. We have to keep playing different things and we must keep on including others, using content for networking, and as a format for experimentation. These are the notes that work well together if we keeping playing them over time. Chuck: But content — even the most useful and engaging — often still smacks of the command-and-control mentality that always informed advertising, where I came from eons ago. Do you think conversation is perhaps riskier than other content formats, because you don’t have as much control? Andy: Well, the reality is that the conversation’s going to happen regardless. Do you want to be present? The game isn’t about protecting information or trying to control the conversation too much. The whole challenge — the whole competition, if you want to look at it that way — is to get as much insight out of your brain and other people’s brains as you can, and then make it public. Because when it’s accessible it has a chance to bring you attention and traffic and leads —‚all the things that we’re looking for. You see, content marketing is really just a contest of generosity to see who can do the best job of taking their insights out of their head and promoting them online. Andy: That is exactly what it is. Chuck: Well then, a few more questions while you’re feeling generous. You run a very successful digital web development company here and, I believe, often get into content creation with your clients. How important is executive presence and participation in content creation? How important is it for the overall effort… and for leaders themselves? Andy: I meet a lot of people who want to abdicate this whole content idea. People who just want to say, “Can someone take it over for me? Can I completely outsource this thing? I don’t want to have to worry about it.” And I remind them that you can outsource tasks, but you can’t outsource friendship and networking. You can outsource a role, but you can’t outsource thought leadership. The question is, “Do you want to be relevant?” Do you want to leverage your title as an executive to bring fortune and glory to your firm or do you want to stay on the sidelines and let someone else do it? Do you want to be relevant, or do you want to allow yourself to be irrelevant? I’m sorry. It sounds harsh, but I’ve been in meetings with super-highly-paid attorneys and people at the top of their game offline — but go try to find them anywhere on the internet. They have selected irrelevance. They have chosen not to be there. They’re not going to be thought leaders because they are hoarding their information or they’re not choosing to spend the time to be present. So my answer for executives who have the highest expectations for results: participating in content is not optional. If you choose not to do it, one of your competitors will. If you don’t give that advice by publishing it, someone else will win that visitor. Some executives don’t create content because they don’t think they have time, or because they don’t want to be exposed (as if there’s some risk). Whatever their personal hangups may be, those are anti-growth emotions. It’s unfortunate, but the only thing your top people accomplish by not investing in thought leadership content is to create more white space and blue ocean for the few competitors who do. Actually, an executive who decides to invest in real thought leadership has a big advantage, because not all executives take it on. Later, years from now, it will be much harder — so the sooner you jump into content creation the easier it will be. And right now, at the executive level, there’s still lots of opportunity to make an impact. Chuck: What’s your advice for execs who may be starting from scratch, trying to simply project a presence, let alone create content or conversations? Andy: Step one is to make your LinkedIn profile sparkle. The professional headshot is the cornerstone of all this personal branding stuff, so make sure that looks really good and is not some weird cropped photo from one of your social networks. Then get to 500 connections. It’ll take you half a day if you haven’t done that yet. Ask for recommendations. Reach out to people to make sure you’ve got five to ten recommendations for your current position. Carefully put in a mix of your professional endorsements. Get your bio professionally written. Make the title relevant. It can even mention a few words about the problems you solve or what your passion is. But this is not optional. This is something that everyone has to do if they plan to go down any sort of path. Chuck: What about executives who want to create content — most of whom, in my experience, will reply that they’re just too busy. My solution, of course, is to interview them on video — all they have to do is talk about the subject they already have down cold. But what do you suggest if they want to create content themselves? Andy: Start with this: Go to bed early. Get up an hour or so early and do something important before you do something urgent. In other words, write two paragraphs of great advice, which will become a seed for something else. But don’t open your inbox until you’ve written something practical, something useful. It will be durable. It will last. Content doesn’t disappear. That’s part of the magic of it. There are millions of other little tactics. I highly recommend that you copy yourself the next time you write an email that includes good advice. Now you have a folder that will start filling up with practical, useful advice that’s written in a personal tone, and which answers important questions for your audience. You can always work with a ghostwriter or hand them off to your marketing team to make those thoughts quickly become articles. Chuck: And when they’re ready to jump from producing content to leading conversations? What should they do then? Andy: Have an offline event — I highly recommend this. Fill the room with one third clients (happy clients), one third prospects (who may hire you), and one third friends and fans. What that produces is word of mouth…it’s chemistry. You’re putting these people together in a mix, and it’s absolute alchemy. You can create a lot of trust in an event, which can in turn improve your close rate for the prospects that attended. It’s very powerful.